ACCEL 500 Series In-Tank electric high flow fuel pump designed to fit directly into most popular EFI applications. 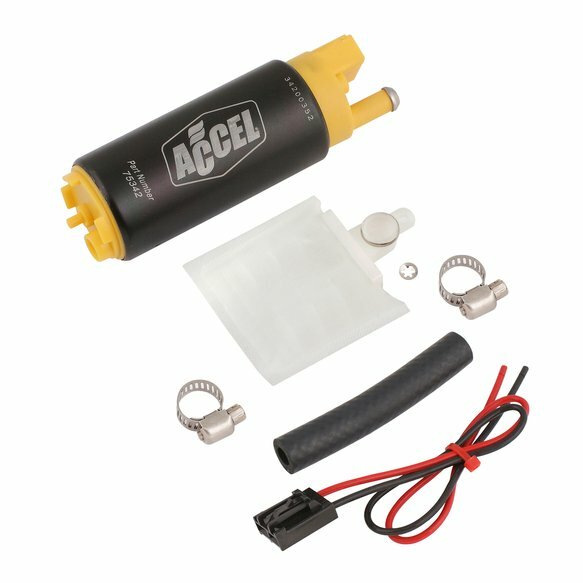 Great for EFI Conversion and Upgrades. Pump design supports up to 900 HP on a naturally aspirated application and 700HP on an application with a power adder. This pump is designed for applications requiring more fuel flow while utilizing the factory O.E. lines and mounting brackets. The THRUSTER 500 can also be used as a universal replacement for applications that require more fuel flow to support additional horsepower while using power adders such as Nitrous, Turbo and Superchargers. Comes complete with installation hardware kit.